I’ll post any photos from our cottage loaf bake-off here, as they come in. Heidi’s latest loaf! Rye with caraway seeds, and perfectly formed.. Pulled together and rested. Kneaded in 10g salt and rested. Kneaded in soaked seeds (20g each pumpkin, sunflower and sesame seeds, 15g linseeds, 1 tsp wattleseed ground) and rested. Kneaded again and rounded up and into fridge. Later removed and after about 1 hour, divided into about 770g and 350g portions (I think). Shaped and left for about an hour. Baked for 48 min. 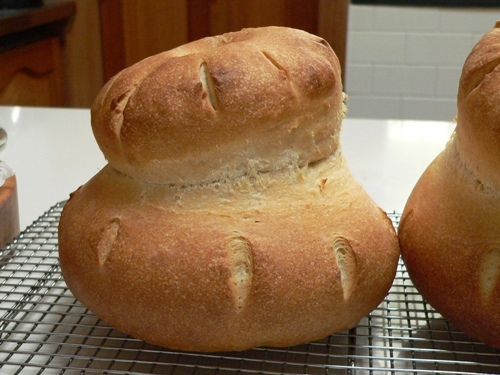 Heidiannie has been baking too – look at this gorgeous rustic loaf! I love the scattered seeds all over it. Her blog post is here – check out her seriously cute three-tiered cottage loaf while you’re there! Sally from Bewitching Kitchen baked this fabulous loaf – read all about how she made it here! 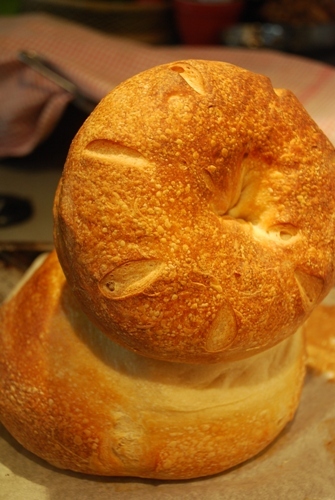 Odette’s cottage loaf, made with this Dan Lepard white bread recipe. She also provided this slideshow of the dough rising! More from Joanna – meet Tweedledee and Tweedledum. They’re made to an old Elizabeth David yeasted bread recipe, which involved baking them in a cold oven! Jo has very kindly provided her recipe in the comments section of the original bake-off post. Some photos of Joanna’s mini cobnut cottage loaf rolls – they’re so cute! 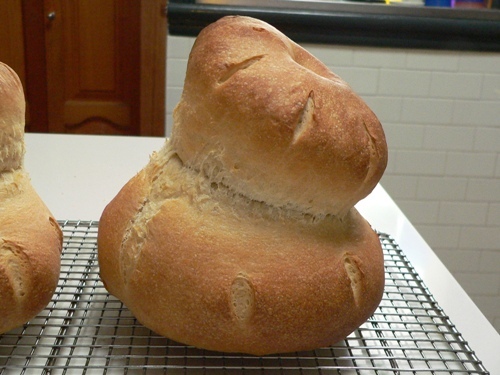 C from Cakes, Crumbs and Cooking baked this gorgeous cottage loaf using a yeasted white dough. Isn’t she clever? …but its twin was a little wonky. Mind you, I quite like them like that – I think they have more personality! It WAS singing! The kids thought it was very cute and laughed themselves silly once they saw it in the oven…they were hoping for the top to pop right off! Thanks for your lovely comments Celia. I had meant to email you and tell you that I was participating, but ran out of time last night. Bed beckoned, but you found my post anyway! The texture isn’t perfect though – perhaps I’ll have to try again…. I can see this might be addictive! Please do let me know if you try again, and I’ll upload any more photos you have..